Beechpoint is an action-oriented Christian camp for youth ages 8-14. 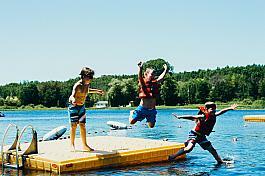 Each camper will have a blast while they swim, tube, fish, zip-line, or wall-climb. They will enjoy the archery, riflery, crafts, go-carts and boating. The pinnacle benefit, however, is that they will be motivated, challenged, and changed through their relationships with their counselors and through what they learn about God's love for them. We are convinced that lives are changed at Camp! Our hope is that boys and girls from every background will have the opportunity to attend summer camp. To help to make this possible, scholarship assistance is available to qualifying families. GENEVA is located in Holland on the shores of Lake Michigan. The goal of each program at Geneva is place campers in relationship with counselors who are on fire for Christ and desire to share that faith with others. GENEVA offers overnight camps for students in 3rd-12th grades each week of the summer. Each age group has programming specifically tailored to provide your child with fun, new experiences, and the challenge to take a step further in faith. 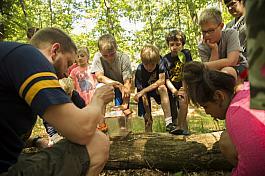 GENEVA Day Camp program introduces children to the excitement of Christian camping. Special weeks include a Thursday night overnight for 3rd and 4th grade campers. We also offer a Spanish Language and Culture week for children in Spanish Immersion programs at school or whose families are native Spanish speakers. Consider GENEVA for your next retreat or event destination. Our retreat ministry staff welcomes the opportunity to partner with you in your planning. We offer two unique sites to serve you - one on the shores of Lake Michigan (GENEVA Shores) and one nestled in a sea of pines (GENEVA Pines). We love to host groups of all kinds, including youth groups, schools, colleges, adults and teams. Located on Kimball Lake in Newaygo, Camp Henry sits on over 200 acres of forests, fields and wetlands. Providing the perfect environment for summer fun! We offer week long camps that include specialty programs such as Wakeboarding & Waterskiing, Soccer, Music, Climbing, and Horse Camps: Service, Adventure, and Leadership opportunities for teenagers from Service Crew to offsite trips around the country to an Assistant Counselor program: plus Day and Mini Camps for younger campers. The majority of our campers come for "Regular" camp, our week long traditional overnight summer camping program where campers have the chance to experience all of the Camp Henry favorites like boating, archery, arts & crafts, and riding on our Big Banana and Magic Carpet as well as the opportunity to select their favorites from over a dozen land and water activities. We serve campers from ages 5 - 17, with many deciding to enroll in more than one session each summer. Camp Henry has had the privilege of serving campers, families, and guests since 1937. We believe that a camping experience at Camp Henry has the capacity to transform lives in many ways. With such a concentrated amount of time, a beautiful natural environment, intentional camp programs and activities, opportunities to try something new, and campers being surrounded by positive Christian role models - the combination is perfect for enhancing and positively changing the lives of campers and guests who come to Camp Henry. Camp Henry welcomes campers of all faiths as well as no faith at all. We don't require, assume, or expect that all campers are Christians or come from Christian families. Our hope is to simply be Christian toward everyone who comes to camp. Our staff members are truly awesome - energetic, encouraging, compassionate, fun-loving, dedicated, hard-working, and full of joy - and can hardly wait to welcome you to Camp Henry - please join us! Camp Henry's intentional programs are designed to allow campers and guests to connect, refresh, learn, and grow. While many camps offer exceptional programs and activities, we take our services to the next level by providing you the opportunity to customize your experience to meet the needs of your group. At Camp Henry you may rent cabins or lodges. You may opt to use any of our in-season recreational facilities or meeting spaces. You may also choose to have our excellent staff lead programming for your group. We can provide the flexibility your organization requires. Our trained staff are service-focused, attentive to details, and are looking forward to creating an excellent experience. Many leaders in the past have shown appreciation for the fact that all they needed to be concerned about during their time at camp was building relationships with the others in their group - we took care of the rest! Camp Henry is available from mid-August through early June for retreat and outdoor education programming. Limited programming is available from mid-June to mid-August. Please contact us for more information at 616-717-5571. Camp Michawana, founded in 1938, is an educational facility located on 188 beautiful acres on Long Lake, 6 miles from Hastings. The Camp serves children, teens and families year around including summer week-long sessions, and Camp-planned weekend retreats. It also features guest group rentals facilities; a seasonal RV Family Campground (54 sites) with cabins/fishing/boating and lots of amenities; and school outdoor education opportunities. Though a non-denominational Christian Camp, all are welcome who will abide by a few simple guidelines. The staff is friendly and well-qualified providing instruction and supervision for waterfront, 3 high adventures, target shooting ranges, team building elements, and so much more. The Camp is fully licensed by the State of Michigan (for 175 children, ages 6-17), and is proud to display accreditation by the American Camping Association. For kids summer camps, visit Camp Michawana's Website for more information. Camp Roger's mission is to encounter and and celebrate God's love for his children through relationships and experiences in creation. Through Day Camp at Camp Scottie, Overnight Camp at Camp Roger, Outdoor Education, and Retreats & Rentals, thousands of students and adults visit our beautiful campuses each year. Our camps build in age group and independence, so that children can grow up through our programs. 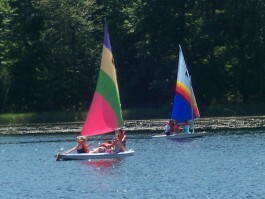 Sessions offer classic camp activities such as swimming, boating, canoeing, braiding, leather crafts, etc. and then add in epic all-camp games, crazy skits, and silly songs. Chapel is held every day and our staff encourages children to develop their own personal relationship with God. o	Situated on a beautifully diverse parcel of land in Howard City, Camp Roger's Summer Camp - Camp Scottie, builds teamwork, leadership skills and friendships in a fun and safe environment. The lessons learned at camp - independence, friendship, problem solving, good judgment, and more - help children grow and thrive. o	Day Camp at Camp Scottie is the newest camp program designed for children who are ready to join camp without the overnight experience. Each age-appropriate adventure has been developed by educators and field experts with a passion for helping children learn through problem-solving and critical thinking. Campers will be given an unforgettable experience that includes hiking, swimming, playing team games and exploring. Mission: Equipping youth for lives of reconciliation in God's world. Vision: To pursue and advance God's vision of wholeness, unity, justice, peace and healing for today's increasingly diverse and urban world by rebuilding relationships that make a positive and lasting difference in the lives of youth. Adventure Camp takes the fundamental principals of our youth camp sessions a step further. Designed for teens, Adventure camp focuses on the need for young leaders in the journey of reconciliation. Adventure Campers engage in various team building activities that are designed to break down existing barriers between groups and lays the foundation for relationships of trust and respect. Tall Turf's teen Leader's In Training serve as peer mentors and motivators in this five day session. Transportation: Free busing is provided for all summer camp sessions from Grand Rapids. Translation Services: All registration materials are available in Spanish. Individuals fluent in Spanish are available to assist with registration and answering questions. CranHill is carved out of a pine forest one hour north of Grand Rapids. Aimed at Transforming Lives into the Image of Christ, CranHill has a variety of options for youth ages 6-17. For kids ages 7-17, CranHill offers a variety of camp options all Summer long. When you are at CranHill, you can expect big games, awesome adventure activities in the woods, in the air, and on the lake! Each day includes times of worship, engaging, age-appropriate teaching with our weekly chaplain, and bible study in cabin groups. We take full advantage of the uniqueness of our campus to show each camper how much God truly loves them. We have crafted our Summer Camps to provide a safe, uplifting, and authentic experience for each camper that sets foot here. Day Camp is an amazing week built to help your child(ren) have an amazing experience and prepare them for what lies ahead for them in CranHill overnight camps. These weeks are crafted specifically for your active adventurers ages 6-8. These young campers are supervised by CranHill staff throughout the day and will participate in exciting activities like riding ponies, going to the beach, face painting, making crafts, Bible stories, and more. It is a full day which gives you the opportunity to hear all the amazing stories from your camper around the dinner table each night. Day Camp is a great way to begin your story at CranHill. Looking for a memorable experience with your family? CranHill has over 120 RV campsites. Come and enjoy peaceful Hillview lake, or participate in all of the exciting activities that the Summer program does! Ala Carte-style activities are offered to our family campground throughout the week, and range from target sports and horseback riding to tie dye t-shirts, pancake breakfasts, and devotionals with our weekly family campground chaplain. Check out our website for more information. In recent years, Gerber Scout Reservation attendance has swelled from 900 in 1997 to over 2,500 in 2012. Much of this increase can be attributed to the 1998 initiation of the Betty Ford Cub Scout and Webelos Adventureland, a section of the camp dedicated to Cub Scouts. Gerber currently has the capacity to accommodate 425 Boy Scouts, 200 Cub Scouts each week or session. 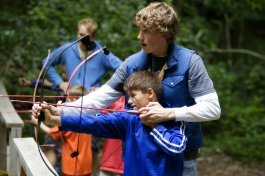 Activities offered at the camp include the Waterfront, Climbing Tower/COPE, Scoutcraft, Handicraft, Environmental Resource Center, Archery, and Shooting Sports, and much more. The new facility on camp is our dining hall, named the Frank K. Merrill Centennial Dining Hall. Centennial Dining Lodge boasts state of the art facilities, a capacity of over 700, and a safe place to take shelter. Gerber Scout Camp Set near Twin Lake, Michigan inside the Manistee Forest, Gerber Scout Reservation boasts an amazing amount of opportunities for Scouts. When you arrive at Gerber Scout Reservation, you can expect a fantastic week of Scout's learning not only Scout skills but, life-long skills in communication, sportsmanship, high self-esteem and leadership. Programs are offered for both the first-year camper and the more experienced Scouts. From our highly visited Handicraft area to our Power Cut program where Scouts will mountain board and cycle, Gerber has something for every Scout. Have first-year and even second-year Scouts that are looking to earn their first advancements towards Eagle Scout? Our Eagle Quest program is the headquarters specifically designed just for these Scouts. Maybe you are looking for something a bit more hands on? Gerber's welding, and metalworking Merit Badges are some of the many examples of the advancement being taught in the Skilled Trades Center. And we haven't even mentioned the aquatics area yet. Gerber's Big Britton Lake hosts a huge variety of Merit Badges that may be difficult to earn anywhere else. From canoeing, rowing, small boat sailing, kayaking, and swimming our waterfront staff is excited to help your Scouts succeed. It doesn't matter if you're a first-year Scout or a Scout leader, all are welcome to come and test their skills at the waterfront. Make Gerber Scout Reservation part of a Scout's summer fun! 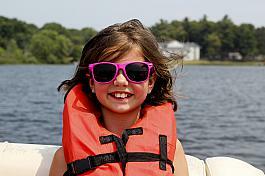 Lincoln Lake hosts summer camps and year-round activities for children, youth, and adults. Our purpose is to provide an experience that will allow people to grow in knowledge of, obedience to, and love for God. Lincoln Lake is a clean, safe environment for children and youth to discover, learn, and grow together. Our guests enjoy over 40 acres of playgrounds, athletic fields, woods, natural wetlands, and open views onto Lincoln Lake. Each age group experiences activities that are uniquely crafted for their age group. "Lincoln Lake exists as an outreach of the local church, using the unique atmosphere of camping to evangelize and disciple individuals through the Word of God." Pine Ridge is a nonprofit inter-denominational Christian Camp with over 70 years of experience serving children, youth and special needs campers. Pine Ridge offers a variety of overnight and day camp programs through the summer weeks as well as year-round private group rentals. Activities are crafted and prepared to offer every age group a variety of appropriate options. Activities at camp include go-carts, laser tag, airsoft, paintball, rock climbing, swimming, horsemanship, petting farm, water sports, arts & crafts, water slide, basketball, soccer, target sports, playground, and so much more. To share and model the message of Jesus in a safe, innovative, and relational setting. Pine Ridge has a beautiful Retreat Center overlooking Pine Lake housing up to 72 guests. Dining Hall, meeting spaces, and game room are also housed in the Retreat Center to conveniently host retreats for churches, schools, and other organizations all from the comfort of one building. A Virtual tour is available on our website. Please feel free to contact us about retreat pricing. Pine Ridge offers age specific programs for all grades. Mini-camps are offered for young children and several camp weeks for teens offer unique activity options and challenging off-site trips. Day Camps give children an opportunity to be introduced to camp and explore our beginner programs. Lunch is provided by Pine Ridge for all Day Camp options. Pine Ridge offers two camp sessions each summer for youth and adults with special needs. 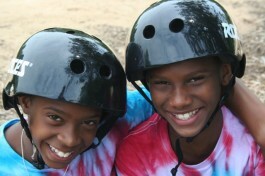 These campers enjoy specifically designed activities to allow them to enjoy everything we offer. Each camper needs to be interviewed by Pine Ridge for acceptance into the program. With sibling discounts, Fetchin' Friends incentives, food sale programs, scholarships and payment plans - we believe every child should have the opportunity to come to Pine Ridge. SpringHill Camps is a nonprofit inter-denominational Christian camp with more than 40 years of experience reaching and serving children. All of our programs reach kids through a very specific ministry model, the SpringHill Experience. The SpringHill Experience consists of being God-immersed, embracing, innovative, integrating, professional, and community focused. We possess a passionate commitment to reaching the lost and being relevant as we share Jesus' message of grace, hope and love. Currently, we reach kids through overnight camp property in Michigan and Indiana. We also provide SpringHill Day Camps hosted at local churches and schools in Michigan, Indiana, Illinois and Ohio. To create life-impacting experiences that enable young people to know and grow in their relationship with Jesus Christ. At SpringHill we focus on bringing the message of Christ to our youth while offering a cutting-edge ministry. With unique programming, activities and housing, your child is sure to try new things, meet great friends and grow in their relationship with God. At SpringHill's Summer Day Camp kids have five full days of SpringHill fun right in their hometown. This is one week out of the summer they will never forget. From the Climbing Wall and Flying Squirrel to Six Square, wild water games and stretching their creativity through cool crafts - they will have more fun than they can imagine while meeting new friends and learning more about Jesus. At SpringHill, we've made it easy for you to build unity, have fun and experience God as a family! At our family camp you'll spend quality time with each other, have interactive sessions and learn how to strengthen your relationships as a family with Christ at the center. All young people are made in the imagine and likeness of Christ and deserve to feel complete worth regardless of where they are spiritually, physically, emotionally, or socio-economically. Our value of embracing all kids is something that constantly shows Christ's love throughout their experience at SpringHill. We understand the economy is uncertain. With discounts, friends for $50, scholarships and payment plans - we want to come alongside your family to help your kids experience camp this summer. SpringHill not only offers weeks of summer camp, but also short weekend retreats with that same SpringHill Experience condensed for groups and families. Rent us! Have you ever considered bringing your Girl Scout troop or sports team to camp? Let us design an amazing retreat for you that will create a memorable experience for everyone. We have had several groups, churches and schools come to camp over the last few months that have had an amazing time! Camp Pinewood is a YMCA camp located in northeastern Muskegon County. 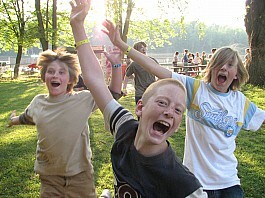 Since 1925 Camp Pinewood has served the children of Michigan through summer, youth group, school, and retreat programs. Our summer programming provides a wonderfully diverse setting for children to develop relationships with their peers from across the world. Camp Pinewood provides both one and two weeks sessions for campers ages 5-17. We teach dozens of outdoor classes utilizing our beautiful 200 acre property and 45 acre lake. Transportation from Grand Rapids may be available upon request. We never turn away campers for a lack of funding - please see our Financial Aid application on our website!